You Buy It. We Clean It. Join our growing network and stay informed. 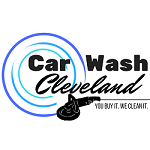 Check out great coupons for Car Wash Cleveland on LocalSaver! Car detailing is the process of cleaning, restoring and finishing of a car to produce show-quality cleanliness and polish. Detailing can be classified into 3 broad categories; interior, exterior and bodywork. All these require different products and services that focus on those areas specifically to produce a superior finish. If you are looking for car detailing services in Cleveland, then bring your car to us for the ultimate interior, exterior or full car detailing that will give your car a new and fresh look and feel. Vacuuming car interiors including the trunk, seats and upholstery to clean debris, dirt and dust. Steam cleaning to get rid of upholstery stains which may also involve using liquid cleaners and brushes. Blowing out vents, dashboard gauges and crevices to remove embedded dirt and dust. Deep cleaning vinyl, plastic and rubber interior parts and ensuring they are well protected. Shampooing carpets, seats and floor mats to not only clean them but also remove any odors. Deep cleaning and conditioning any leather interior to make it durable and fade resistant. Cleaning and polishing the inside and outside of glasses. Cleaning doorjambs and lubricating hinges and locks for long lasting and easy use. Grease and tar removal from your car’s surfaces. Steam cleaning doorjambs and lubricating hinges and locks. Treating and steam cleaning wheel wells, rims and moldings. Cleaning any crevices in the car body as well as emblems. Dressing exterior moldings, tires and bumpers. Applying premium wax to improve reflectivity and give your car a new bright shine. Treating and protecting your car’s fabric from stains and dust. Window treatment to improve visibility and repel rain and snow for the front windshield. Leather and vinyl protection with a clear and permanent coating. Paint protection with high-tech polymers which offer protection against oxidation, fading and loss of gloss. Steam cleaning and detailing engine. What should full car detailing include? Your car’s paintwork is very delicate piece of work that requires careful and professional care to maintain its condition. Our paintwork professionals therefore employ a multi-pronged approach to clean, correct and protect the painted surfaces. The cleaning process involves washing and drying the car to get rid of grime and dirt. Thereafter, there is clay bar application to remove contaminants in the clear coat which may include metal particles, tar and dirt. Once that is done, the surface is polished to remove fine scratches and any swirl marks. Finally, the paintwork is sealed through waxing which not only protects the paint but also helps it shine. The chassis and undercarriage of the car will be cleaned alongside other exterior parts. This also includes wheel wells, suspension components and directly under the car. Once that is done, the inner fender liners and splash guards will be dressed with protection. Additionally, after thorough washing, the wheels and tires are also dressed in a protectant. This helps improve their luster and also prevent cracking and corrosion. After a period of use, headlights and taillights start showing signs of oxidation which affects their performance. During detailing, they are polished to restore their performance and sealed to offer long lasting use and reduce oxidation. The chrome, vinyl and plastic trims are also cleaned and dressed. This helps protect them from fading and cracking thereby maintaining your car’s condition for longer. In addition, the exhaust tip will be cleaned and polished as well. This involves cleaning of all seating surfaces, carpets and interior car upholstery. It is usually achieved through a combination of vacuuming, steam cleaning and shampooing. Moreover, plastic and vinyl parts are thoroughly cleaned and dressed and any leather interiors cleaned and conditioned. Interior detailing mainly concentrates on the passenger area however we will also include the trunk area for a wholesome package. Engine cleaning forms an important aspect of car detailing as it is the powerhouse for your car. Usually, the engine is misted lightly with water, then cleaned with a degreaser and thereafter rinsed. It is then dried before the rubber, plastic and silicone parts are dressed in a protective layer. This helps ensure that the engine works properly and is protected from cracking. Our detailing professionals are always ready to give your car the restoration and shine it deserves. Over the years, we have provided high quality auto detailing services at our state of the art facilities. 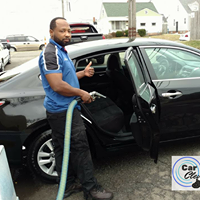 If you are looking to have the best quality car detailing services in Cleveland, then don’t hesitate to contact us!